Alnwick, like most of the great castles, has had a succession of owners beginning with Ivo de Vesci who married the granddaughter of Gilbert Tyson, a Saxon killed at Hastings in 1066. The zigzag moulding on the arch in the arch that leads to the inner courtyard reminds visitors that Alnwick has been a fortification for the better part of a thousand years. The barony of Alnwick and its castle continued in the de Vesci hands until the fourteenth century with intermittent lapses into the hands of David of Scotland and William the Lion although it should be noted that during the reign of Henry I Eustace FizJohn was the castle’s owner. He married the de Vesci heiress of the period and their son William assumed his mother’s name. Ivo built a motte and bailey castle from timber – by which we can suppose some hapless Saxons found themselves moving soil and digging ditches. There were two baileys – one to the east and one to the west. Over the years fortifications were added to the central shell keep and to de Vesci’s two baileys. By 1135 it was one of the strongest castles in Northumberland. In actual fact when William the Lion besieged the castle in 1172 he was unable to capture the castle from William de Vesci. In 1174 the Lion had another go at it and was captured by the English. Part of the reason why William spent so much time hammering on Alnwick’s doors was that he had originally been the Earl of Northumberland but Henry II had removed it from him some twenty years earlier. Perhaps that was why William joined in the revolt by Henry II’s sons and his queen against Henry II in 1173. William found himself bundled off to Newcastle and from there to Normandy. William was forced to recognise Henry II as his feudal overlord and in so doing sewed the seeds of the Scottish Wars of Independence when Edward I insisted on the right to naming the Scottish king and to being the feudal overlord of Scotland. The de Vescis who did not get on terribly well with King John. It was only luck that the castle wasn’t razed in 1213. William de Vesci died at the Battle of Bannockburn the following century without heirs so the king sold it to Anthony Bek, Bishop of Durham who sold it to Henry de Percy. De Vesci did have an illegitimate son and was able to hand his Yorkshire lands to his natural son. The Percys did rather a lot of rebuilding based on the income from the Scottish wars; either loot or ransoms. The two huge octagon towers that tower above the inner gateway were built sometime around 1350 and this phase of rebuilding included the rebuilding of the keep with seven U shaped towers. The castle had been successively strengthened by all its owners but this was the time when the Percy family were most wealthy and the reality of having a bellicose neighbour meant that fortifications were a good investment. The fortunes of the Percys declined with the Wars of the Roses and the accession of the Tudors. Margaret of Anjou had garrisoned Alnwick with three hundred french troops in the aftermath of Town in a bid to retain a toehold on her husband’s kingdom. It was a Scot who rode to the garrison’s rescue on that particular occasion so that Margaret’s troops could make good their escape from the forces of the Earl of Warwick. Put simply they were the over mighty subjects that a strong monarch needed to keep firmly in check. They continued to fulfil their role on the borders however. The Alnwick Muster Roll dating from 1513 identifies the men who fought under the Percy colours at Flodden and survived the encounter with the Scots. When not at war with Scotland there was intermittent raiding. In 1528, for example fourteen Scottish reivers were hanged in Alnwick. However, not even their hereditary role of warden was secure any longer nor were the earls necessarily cut out for border warfare. The Percy family were not as wealthy as they had once been and in 1567 when George Clarkson was commissioned to assess the castle it was deemed unfit for purpose. Perhaps lack of cash was something that the earl should have considered before conspiring with the Earl of Cumberland and Leonard Dacre to raise the north in rebellion against Elizabeth I. 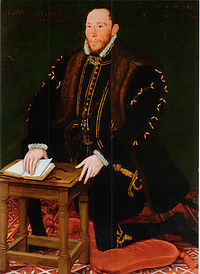 In 1569 matters came to a head with the Earl of Northumberland revolted along with the Earl of Cumberland in a bid to return England to Catholicism. The people of Alnwick were caught up in the rebellion. Although numbers of rebels dwindled rapidly after the initial success of capturing Durham and celebrating the Mass there before marching into Percy’s Yorkshire estates Alnwick Castle did prepare to withstand the Queen’s forces. Hartlepool was also captured by the rebels with the intention of providing a safe harbour for the Duke of Alva to land Spanish troops. The Spanish Ambassador it should be noted had already told the conspirators that they had not chance of succeeding in their venture. The arrival of Sir John Forrester (or Forster depending on the source) the Warden of the English Middle March on the East side of the country was sufficient for earl’s tenants to hand over the castle and hurry to their own homes. Forrester also blocked the passes so that men who might have joined the rebels could not join with the earls whose thoughts swiftly turned to flight. There was much rebuilding during the eighteenth and nineteenth centuries to transform the medieval fortress into a stately home. It was in the 1750s that it became the main residence for the Duke of Northumberland who commissioned Robert Adam to make the castle more habitable not to mention fashionable. In the Nineteenth Century Salvin was appointed to create more modifications – the fourth duke liked his castle with a romantic tinge. It remains the second largest inhabited castle in England and reflects a gothic Italian styles admired by the family at that time.